My idea was originally to do a series of yoga paintings, having been a long time practitioner. Then a moment looking at a newspaper sports photograph changed all that. I saw the yoga in the frozen action, a baseball pitcher poised elegantly on one leg. It reminded me so much of the Great Blue Herons I see fishing, with all their intelligence focused down their beak to the point, waiting to strike. It’s as if the intent of being is what creates the form, and it’s all held in a receptive field. I painted them as if they were herons, or dancers. 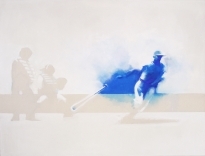 Each painting is a moment of suspended animation, a little slice of the action of the wind up, the pitch, and the follow through. Breath is the moment between pitches, an interval of letting go of the past and gathering oneself up for the present again. More recently, I have begun to paint not just the action, but the huddles on the mound. The fascination with the body has begun to reveal a language common to men, but mysterious to me. Stand by.